On/off phenomenon in Parkinson's disease happens when levodopa wears off and motor symptoms return, before it's time for your next dose. What causes on/off episodes in Parkinson's? On/off episodes, also known as “off” time, typically happen more often as Parkinson's disease progresses, and levodopa becomes less effective. Carbidopa/levodopa is considered the “gold standard” in Parkinson's disease treatment, meaning it's the most effective for treating motor symptoms. Patients first start taking levodopa at around three doses per day. If you start experiencing “off” episodes, your doctor may increase your dose to four or more times per day. Off time is common: According to patient surveys, around half of patients who take levodopa report experiencing wearing off periods. Of those patients, 24% experience it 3 to 6 hours per day, and 52% have symptoms for 1 to 3 hours a day. What does on/off phenomenon feel like? Off time is different for everyone, and depends on how your Parkinson's symptoms normally present themselves. For some, tremor may be the first symptom to re-appear, while for others, it could be muscle stiffness, or non-motor symptoms such as a change in mood or thinking, or fatigue. If you notice a change in your symptoms, talk to your doctor. Before your appointment, try tracking when your off time starts and stops. Take note of how you feel when your medication is working optimally, compared with the changes you're experiencing. If you're experiencing periods of time when your symptoms return and interfere with your daily activities, talk with your doctor. There are a few different steps you can consider taking to increase your symptom-free hours during the day. Change the dosage or timing of your carbidopa/levodopa. Taking your medication at different times, or increasing your dose, may help reduce your off time. Try a different medication. Your doctor may suggest another medication to add to your regimen, or a new carbidopa/levodopa option, to help reduce “off” episodes. You may also consider a recently-approved treatment for "off" time. An inhaled levodopa powder for off episodes, Inbrija, was recently approved by the FDA. Adjust your diet. Because levodopa is a protein building block, it competes for absorption in the brain with other proteins. It's best not to eat a high-protein meal before taking your medication. For example, you may save fish, meat, and cheese for dinner and eat more carbs and vegetables during the day. Consider a clinical trial. If you're interested, there are also several treatments in development for "off" time in Parkinson's disease. Start your search for a clinical trial near you. 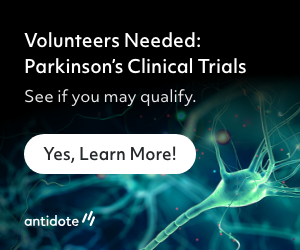 See if you qualify for Parkinson's clinical trials near you.